Star Wars BB8 Pet Costume Stuffed Body Headpiece Sz S,L, XL NEW Star Wars BB8 Pet Costume Stuffed Body Headpiece Sz S,L, XL NEW Buy with confidence! My store offers authentic merchandise from a smoke free environment and from an honest seller. Take a look at my feedback and rating and you will see that this is an amazing place to shop. Thank you for shopping at my store! Star Wars BB8 Pet Costume Stuffed Body Headpiece Sz S,L, XL NEW Buy with confidence! My store offers authentic merchandise from a smoke free environment and from an honest seller. Take a look at my feedback and rating and you will see that this is an amazing place to shop. Thank you for shopping at my store! 100% Authentic Fast Shipping With limited time as a one women business, one of my top goals is to get my merchandise listed fast to provide you with the great deals I find. Therefore, my descriptions aren't always filled with a lot of information. If you ever need additional information please do not hesitate to send me an e-mail. I stand by my products and strive to provide excellent customer service! Payment We only accept payment through PayPal Please pay as soon as possible, as that will allow me to send your item to you sooner! Shipping I offer FREE shipping on most Domestic orders! Your order will be dispatched within 1 working day of receiving payment (Monday-Friday) Return Shipping is the responsibility of the customer. Returns If you are not 100% satisfied with your purchase, you can return the product and get a refund or exchange. My store offers a 30 day return policy. Any product you return must be in the same condition you received it. The items in their original packaging with the tags attached . Thank you for shopping at my store ! Star Wars BB8 Pet Costume Stuffed Body Headpiece Sz S,L, XL NEW Buy with confidence! My store offers authentic merchandise from a smoke free environment and from an honest seller. Take a look at my feedback and rating and you will see that this is an amazing place to shop. Thank you for shopping at my store! Star Wars BB8 Pet Costume Stuffed Body Headpiece Sz S,L, XL NEW Star Wars BB8 Pet Costume Stuffed Body Headpiece Sz S,L, XL NEW Buy with confidence! My store offers authentic merchandise from a smoke free environment and from an honest seller. Take a look at my feedback and rating and you will see that this is an amazing place to shop. Thank you for shopping at my store! 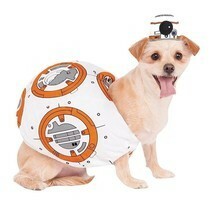 Star Wars BB8 Pet Costume Stuffed Body Headpiece Sz S,L, XL NEW Buy with confidence! My store offers authentic merchandise from a smoke free environment and from an honest seller. Take a look at my feedback and rating and you will see that this is an amazing place to shop. Thank you for shopping at my store! With limited time as a one women business, one of my top goals is to get my merchandise listed fast to provide you with the great deals I find. Therefore, my descriptions aren't always filled with a lot of information. If you ever need additional information please do not hesitate to send me an e-mail. I stand by my products and strive to provide excellent customer service! Payment We only accept payment through PayPal Please pay as soon as possible, as that will allow me to send your item to you sooner! Shipping I offer FREE shipping on most Domestic orders! Your order will be dispatched within 1 working day of receiving payment (Monday-Friday) Return Shipping is the responsibility of the customer. Returns If you are not 100% satisfied with your purchase, you can return the product and get a refund or exchange. My store offers a 30 day return policy. Any product you return must be in the same condition you received it. The items in their original packaging with the tags attached .